"I need a drink," she joked after finishing the final leg of the three-month journey which saw her contend with some treacherous weather in the air and logistical obstacles on the ground. 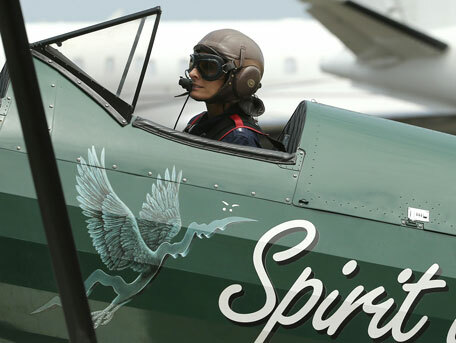 Modelled after pioneering aviator Amy Johnson's historic 1930 solo flight from England to Australia, Curtis-Taylor said her journey was a homage to female pilots of the past. 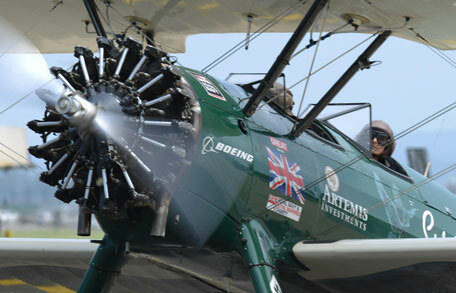 She said flying the open cockpit biplane had given her an "insight into something of what she (Johnson) went through getting here". "The flying has been sensational and that's why you do it," she told reporters at Sydney airport shortly after her arrival. "To fly something like this, low level, halfway around the world seeing all the the most iconic landscapes, geology, vegetation... it's just the best view in the world. It's the best adventure in the world." She crossed the Timor Sea to Australia this month. Curtis-Taylor said she struck some bad weather, mostly in eastern Europe, as she flew the stick and rudder airplane with basic period instruments. But as the journey involved frequent stops because of the plane's short range, many of her obstacles were not related to flying. "I've lost my rag several times dealing with people on the ground," she said, adding that she spent seven hours trying to get fuel at one airport. "In the end I just lay down on the tarmac and went to sleep with my head on my handbag." She said that it was an experience to fly over Australia, where her stops included the outback towns of Tennant Creek and Alice Springs and flying over the monolithic rock Uluru. Curtis-Taylor, 53, said she would love to continue the adventure and fly up north along Australia's east coast. But instead the plane, which the aviator said "did not miss a beat" during the epic journey, will be shipped to the United States.